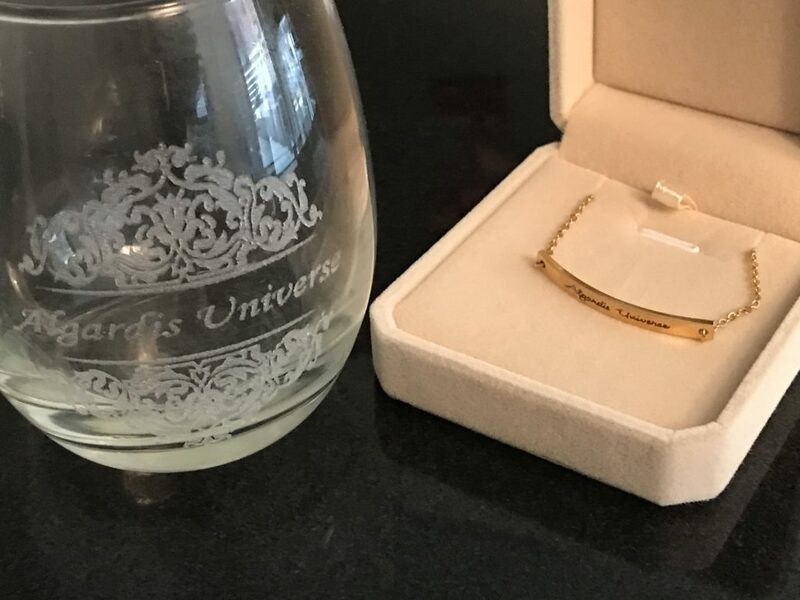 Algardis Universe Giveaway – Personalized Gifts! Congrats on winning the Algardis Universe prize DAWN ROBERTO! 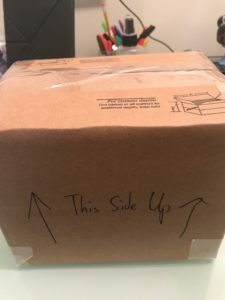 Your package is on the way! I can’t believe I’m saying it – but the end of the Courtlight series is coming very soon! It’s really hard to imagine but I’ve been writing this particular set of books for five years and now to see it close is just a tad tear-jerking. But it couldn’t have come at a better time as I’m full-throttle into the Crown Service series and opening up a third series in the Algardis Universe that I’ll hope you love this summer as well. So now – the point of this post. In sincere thanks to you the readers for staying with me so long I’ve partnered with a beautiful merchandiser, Personalized Gifts, to bring a great giveaway to you! You can see the gifts I have for you below and I’m pretty sure every fan of Courtlight can find a use for one item or the other. So enjoy! An Algardis Universe Monogram Necklace and Wine Glass are yours for the taking. Easy entry and the contest is open internationally. Winner is chosen randomly. 09/03/16: Wow, I’ve already gotten emails from Canada and the UK asking for the Support Packs. So I’ve added international shipping. Enjoy! This is a one-stop-and-shop combination designed to get everything you’ve wanted in a single grab bag. All of that in one mailing for $9.99. Shipping included. I know, amazing right? It’s pretty impossible to find that combination of swag and goodies anywhere for such a low price. As of right now, I am not selling signed paperbacks or t-shirts separately, but if I do the support pack pricing will change. NEXT! 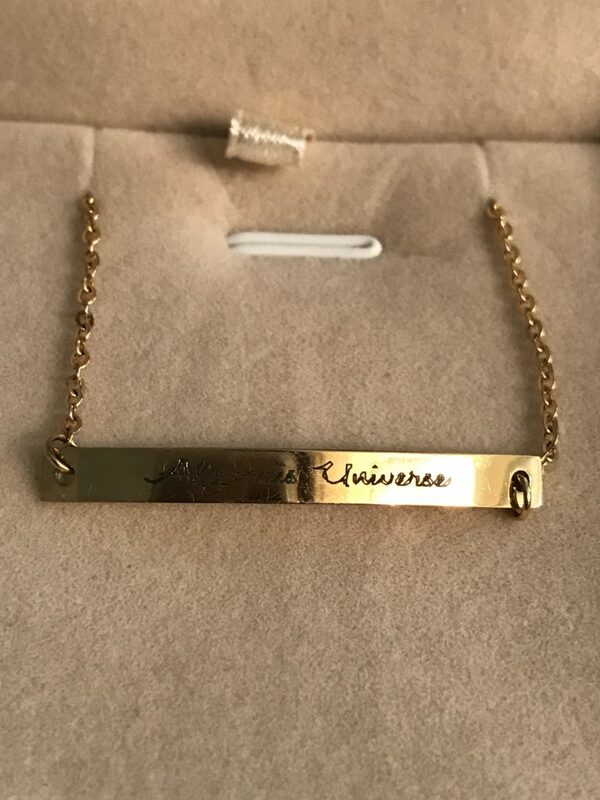 I am so excited to let you know that you are not limited to just my store for custom Algardis Universe merchandise! 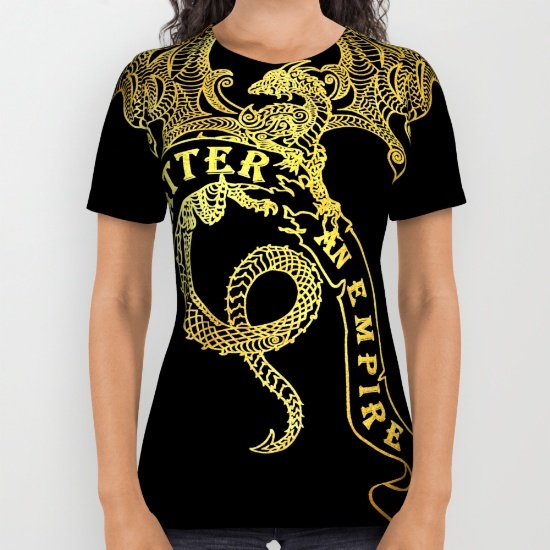 I am proud to announce that Upon A Day Dreamer, an amazing graphic artist, has opened a Society 6 store and included the ‘Shatter An Empire’ tagline in a line of apparel for me as a featured author. So you are welcome to buy merchandise from her as well. 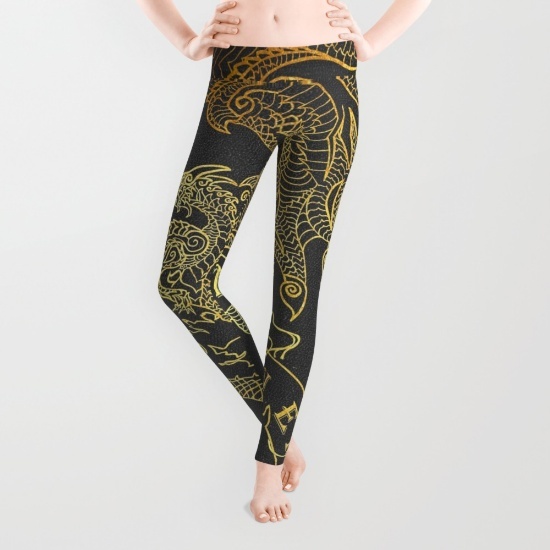 You can see more examples of her Society 6 merchandise below. Go crazy and get all the things! The great thing about the Upon A Day Dreamer shop (and others like it) is that you can get any shirt size, color, and/or fit you want. Want a sweatshirt? She’s got it! How about a fitted t-shirt with v-neck? Also available! I love variety like that and the design is stunning too! Happy shopping! 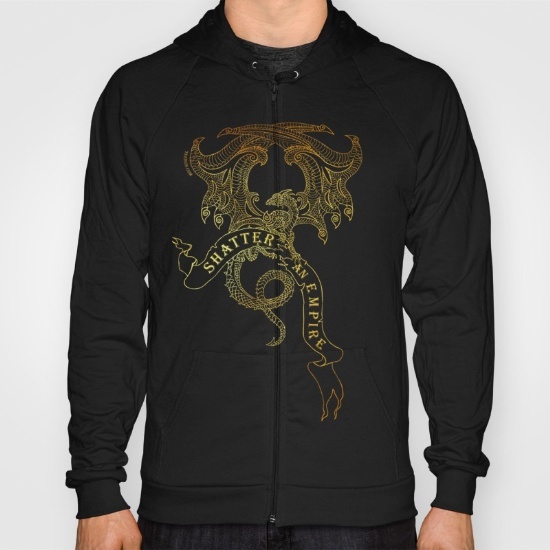 And if YOU decide to open a reader/artist merchandise store with items related to my books, I am more than happy to give you a shout out too! Just send an email. The wallpaper section of my website has been updated with new wallpaper downloads for all of your mobile devices. There are three downloads available to you now and a secret fourth that you can unlock by going to your local library! All you have to do to get the secret 4th is go to your library’s online website or stop by the library in person, take a picture of Courtlight in their catalogs and share with @tedunwrites or by email to assistant@terahedun.com. Check out the wallpapers by clicking the link and here’s a sneak peak of the secret wallpapers available to you below. I usually post In My Inbox on my TUMBLR account – located here – POST 1, POST 2, POST 3 etc. But I thought I’d try something different and post them on my blog as well. Here’s some of emails I’ve gotten recently and my responses as well as goodies in the mail. It’s hard for me to believe you have given up on or put off Courtlight 7. That’s what it kind of feels like to us. I know you are working on the Spanish version of Courtlight and other things. But…. I think it would be a smarter move for you to work on the new book. It feels to your loyal readers that you have forgotten about us, and given up on Ciardis and Sebastian. I haven’t forgotten about my core readership Gail! But you’re right I haven’t been releasing as quickly as I have in the past. I’m trying to do so many things at once and I’m only one person. Luckily, I now have a great team of individuals who are helping me move forward. After reading your impassioned letter I couldn’t not try to re-prioritize my days. 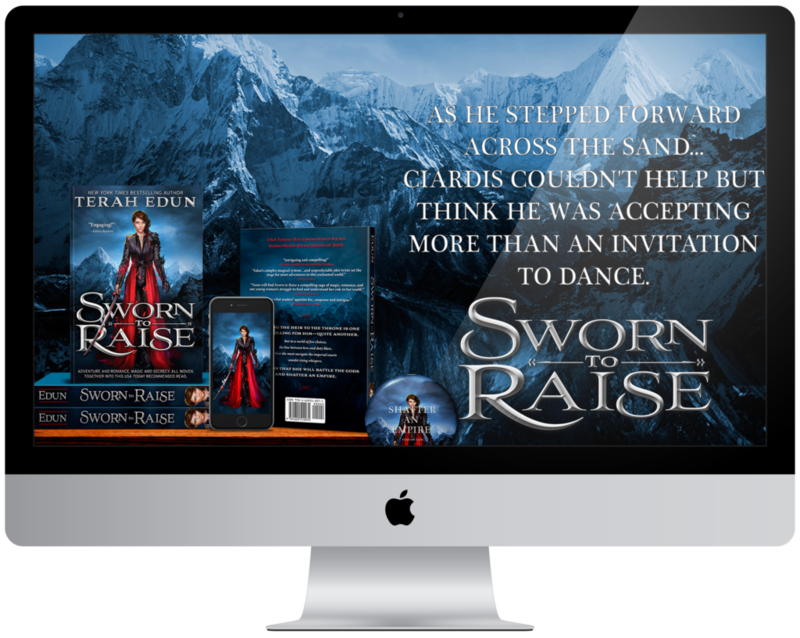 I’ve passed on CHAPTER TWO of SWORN TO VENGEANCE: COURTLIGHT #7 to Rachel (my Author Assistant) and she’s sharing it in The Guild (the Facebook Fan/Reader Group) as well as select quotes from the rest of the manuscript in the coming days. Rachel has direct access as I’m writing and editing now, so you won’t have to wait for extras or tidbits for long and the book will release quicker. Just wanted to inform you that the for iTunes, when I pre-ordered your book 7 for the court light series and downloaded it, it gave me book 6. Not sure if I’m supposed to contact you or apple but thought it was worth a shot! First of all, a huge thank you to Sri and six other readers who emailed me at 1:00am to tell me there was a problem. I can’t tell you how amazing that it is. Second – This was completely my fault and I’m incredibly sorry that you were disappointed like that. It’s been a crazy week, a crazy month, a crazy summer. READ MY NEXT POST to see at least partly why. But I’ve been working on translations for three languages, a new library program, and closing out two bundles for 27 other authors so I’ve been working like a madwoman to clear my plate. All of these objectives are something that I LOVE DEARLY and I’m so excited about. I can’t wait to see wait for you see what I’ve been planning but in the meantime Vengeance got accidentally pushed aside. (Not anymore though – see Letter One lol). 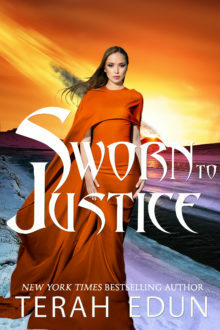 My apologies all that I forgot to change the pre-order on iBooks for Sworn To Vengeance on iBooks (that’s totally on me), and some of the copies have already gone out. Fortunately its NOT an unfinished copy of Courtlight #7 but instead the prequel book. I’m working with iBooks to edit this and I really appreciate the 7 readers who emailed in the dead of night to let me know. Your support and dedication is simply amazing. I’ll update you when I know what will happen regarding the pre-order but email me terahedun.ya@gmail.com or Rachel at assitant@terahedun.com to get a personal response before then. 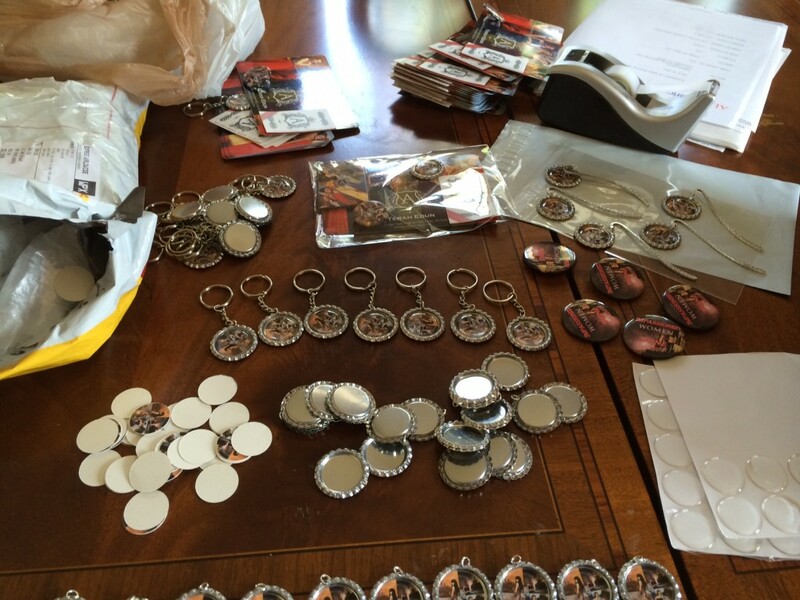 I was wondering if you give out book swag and / or how to go about getting book marks? Plus I was wondering where I could get autograph copies of your books I have them all on the nook but I would love actual books to hold. Thanks for the email! 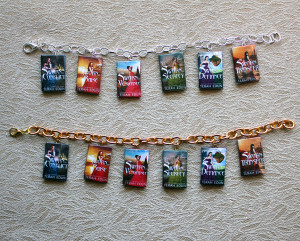 I do give out book swag. 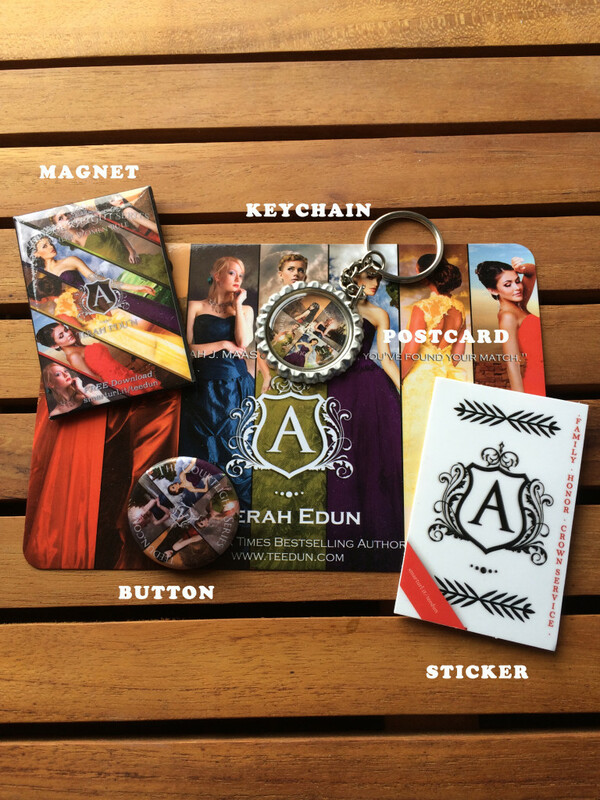 Just send an email to assistant@terahedun.com with your physical mailing address and I’ll get some plus bookmarks over to you. I’ll be having a few signed copies of the first four Courtlight books available through my website in August so look out for that as well! 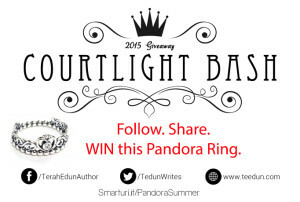 The Courtlight Bash of Summer 2015 – Pandora Jewelry, Swag, and More! Thank you everyone so, so very much to everyone who entered this giveaway and for all of your amazing support. Without you The Courtlight Series would not be where it is today! It is lovely readers like yourselves who help keep the world of Algardis rife with adventure, romance and excitement! With that, here is the list of our winners! 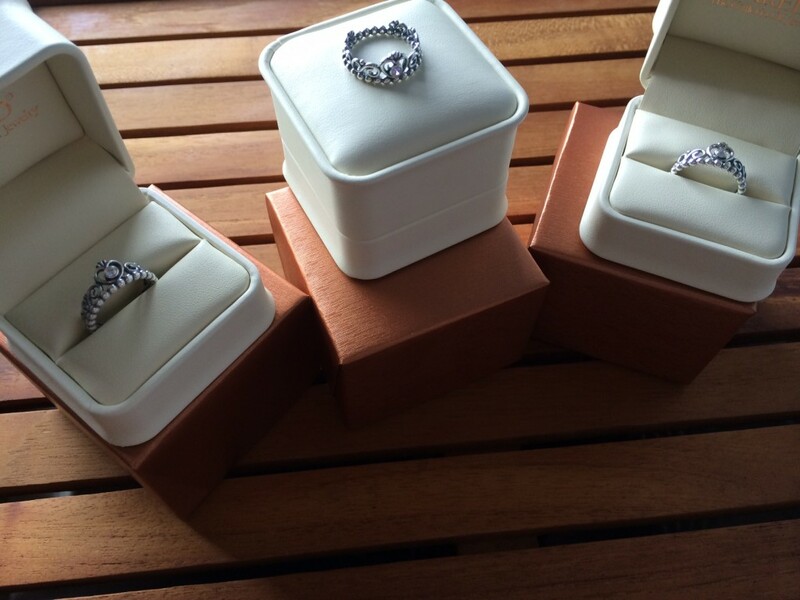 PANDORA RING GRAND PRIZE WINNER: Paulina D.
SECOND PRIZE COURTLIGHT BRACELET WINNERS: Austin B, Bube P, and Tracey R.
Wendi S, Giedre S, and Trinitee M.
I will be contacting everyone so we can get your mailing address in order to get your prizes out to you as soon as possible! Thank you again! The Courtlight Series has sold over one hundred thousand copies and in thanks – I’m doing a giveaway to end all giveaways! WHERE: Global access baby, if you’re online anywhere in the world, you can WIN! WHEN: July 11th – 25th, 2015, winner announced on the 31st! 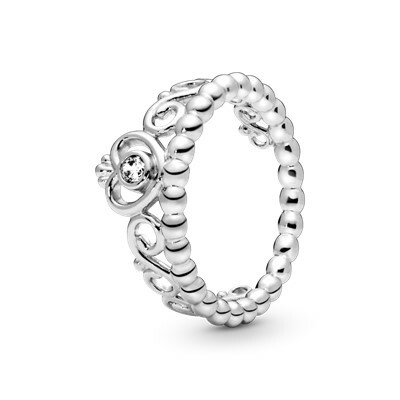 There are MANY prizes and only ONE way to get the Pandora Ring. All prizes awarded on July 31st! Not quite sure how you got to this page or who I am? 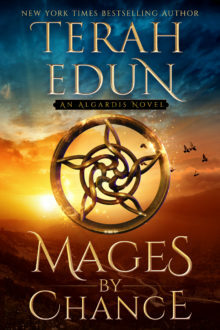 About the Author New York Times and USA Today Bestselling Author Terah Edun is a young adult fantasy writer that writes the stories that she always loved to read as a young girl. Her Courtlight and Crown Service series can be seen on the USA Today Happily Ever After blog. June Giveaway – Winners Get Awesome Swag! 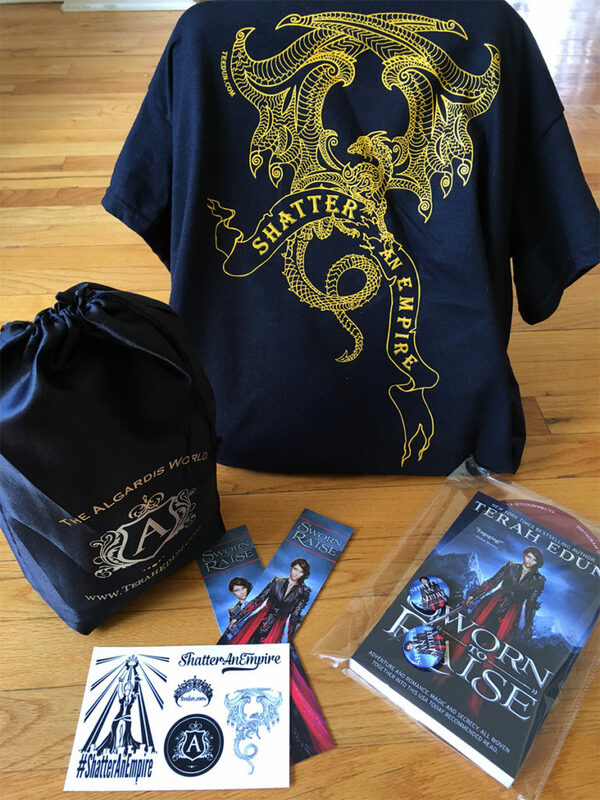 For every person who posts a 30-second video on Youtube this month OR shares their artistic skills with the world by posting fanart on TUMBLR – I will send them one of these gorgeous swag packs. ANYWHERE in the world. If its a Youtube video, you have to show at least one of the Courtlight covers on your eReader or have a print copy. But it can be a book review, a 30-second scream fest, a discussion of the series, surprise me! Email a link to your fanart post on social media or Youtube video to Rachel, assistant (at) terahedun (dot) com. All entries should be in by June 25th! If there’s enough I’ll post the winners at the end of the month. 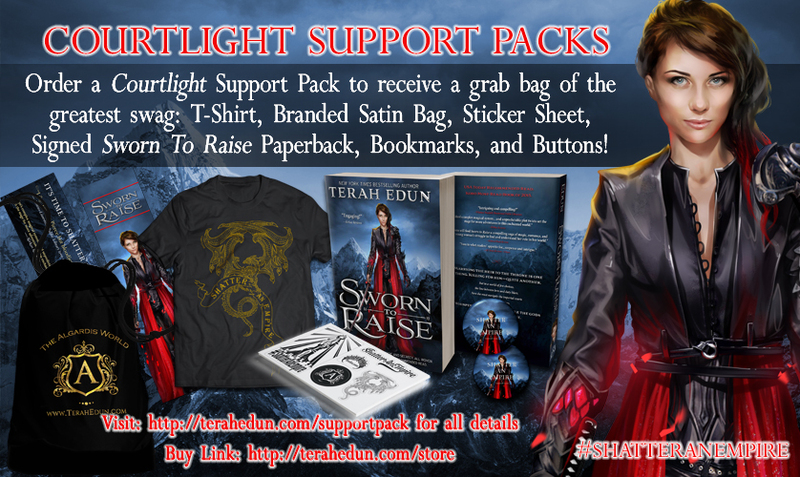 If I get more than five entries, I’ll not only post the winners of the swag packs BUT ALSO pick one grand prize winner who will receive one item of their choice from my store – TERAH EDUN STORE. How’s that for incentive? As I mentioned before I was working on setting up a store of branded Courtlight and Crown Service goodies. I’m very picky about the quality of the items I’m willing to sell and these passed the test with flying colors, so even if you don’t want to buy go check them out!